As I pointed out, William George Unruh, better known as, Bill Unruh is a little-known but quite important Canadian physicist, and now you will hear him much more because he, along with Paul Davies and Steven Fulling prophesied through mathematics, Something very common among physicists as I have commented before several times. To give you an idea of ​​the important thing, Hawkings, the radiation of Hawkings is a sub idea of ​​the Unruh effect. That is, the radiation of Hawkings is based on the Unruh effect. Returning to the subject, this effect is based on the black body radiation where, considering that everything in this life is electromagnetic radiation, the radiation of the black body is a relation between the temperature of an object and the radiation it emits because, Every body emits radiation if it is above the absolute 0 or 0 Kelvin. This frequency can be observed and measured, and in fact, cosmic background radiation is a basic example of this, as I explained some time ago. Now, the radiation of a black body, being a wave, depends on the speed of the body that observes it. That is, the Unruh effect tells us how and how much radiation we can observe from another body depending on the reference systems. It is something like the Doppler effect where if a body or an object is accelerating, if it observes another body will see that its surrounding is warmer and therefore radiates an electromagnetic radiation. This explains why the vacuum is not really empty. That is, although we say that the void has nothing, that the space, which is empty by its name does not contain anything is a false statement because we have used a wrong name. The vacuum is not empty, it is full of radiation at different wavelengths. That is why the object that accelerates if you look at another inertial (remember, that its sum of forces is 0) what you see is the wake that the object that accelerates is leaving or the “compression” if it is approaching, observing a quantity of Radiation that is not the real one and therefore, seeming that space is like a gas. All thanks to the quantum states of radiation that are the ones that make up the universe (the tissue… something that sounds very strange and that is why it is better to understand what radiation is seen or not, and therefore energy (remember). The vacuum being the lowest energy state simply. Now, if we talk and drop the EmDrive engine, the opposite would happen and explain why nothing is detected and it seems that the engine runs alone. We would be the inertial observer seeing this, the body that accelerates, which is really as if it does not emit any radiation when, actually, when it is accelerating, it is emitting radiation and therefore, there are particles that are pushing the body… That there is a push because there is a gradient of energy, of the vacuum itself. 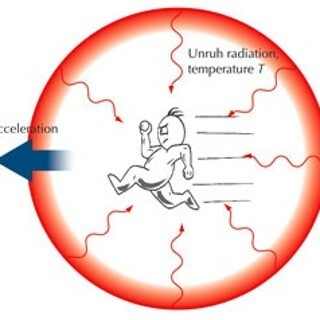 Unfortunately the Unruh effect can not be observed from the inertial system and, although mathematically correct, there is no evidence that it has been measured and seen for now. And since it is not seen and is only on the blackboard (the blackboard of mathematics), it is a hypothesis, it is neither theory nor law.